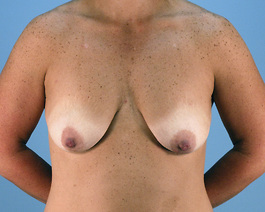 This 32-year-old patient from Virginia Beach came to me to discuss breast implants. She wanted an increase in her breast size and also to fill the hollow above. She also was very interested in a full breast lift. It is now very well established in plastic surgery that women with heavy, sagging breasts must have breast tissue removed with the lift to give the best possible result. This woman had 400 cc implants placed and at the same time, I removed 214 grams of breast tissue on the right and 152 grams on the left. 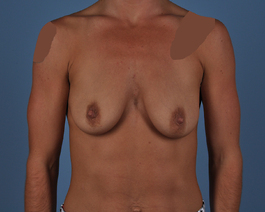 Prior to her procedure, we discussed that her areolas were large and when implants are placed with a lift, less skin can be removed due to greater volume. For that reason, there is an edge of her old areola next to the vertical scar. The scar appears wide because there is pigmented skin next to it. This can be easily removed under local anesthesia at a later time if the patient desires. Following her surgery, we can see the small amount of remaining skin on skin which demonstrates the powerful effectiveness of this type of lift. It is an aggressive treatment for breast sag and is just as safe as the old skin tightening techniques. I was honored to present my technique at the International Meeting of the American Society of Aesthetic Plastic Surgeons in Montreal, May 2015. The "After" photos were taken 7 months following the procedure.